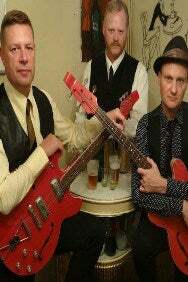 We do not curently have theatre tickets available for Graham Day & The Forefathers. This could be because we have simply sold out or it could be that this show is no longer running. The information on this page remains purely for historical and informational purposes. Graham Day  legendary vocalist, guitarist and songwriter for garage/psychedelic icons, The Prisoners. Long Heralded as one of the great lost bands and influential across so many quarters, The Prisoners story is a long one and continues as an ever increasing list of contemporary acts including The Charlatans, The Stone Roses & The Inspiral Carpets cite them as influences. Following the demise of The Prisoners, Graham Day and Allan Crockford joined forces with Wolf Howardand later Fay Hallam, to form The Prime Movers, a rockier more progressive sound including the 'Earth Church&' LP, which was hailed by the now defunct Sounds Music Weekly as LP of the year.